The story of Jesus healing the blind man with spit and dirt in the ninth chapter of John's Gospel is so full of action and angles to explore that it can be hard to keep track of it all. A good entry point might be to look at the healing story and the subsequent controversy as a series of 7 conversations. As the conversations go on, you will notice how the blind man's eyes become more and more clear and the religious leaders' become more and more blind. Jesus' disciples see a man who had been blind from birth. They ask Jesus that ultimate question that comes when we encounter suffering: "Why?" They assume (much like Job's friends) that suffering is the direct result of sin. So they ask, "Was [the man's blindness] because of his own sins or his parents' sins?" (v. 2). Jesus answers, "Neither." This is important because Christians don't believe in karma. N. T. Wright is helpful on this point: "We have to stop thinking of the world as a kind of moral slot-machine, where people put in a coin (a good act, say, or an evil one) and get out a particular result (a reward or a punishment). Of course, actions always have consequences. Good things often happen as a result of good actions (kindness produces gratitude), and bad things often happen through bad actions (drunkenness causes car accidents). But this isn't inevitable. Kindness is sometimes scorned. Some drunkards always get away with it" (John for Everyone, Part 1, 133-134). Rather than getting sidetracked with an intellectual discussion of the problem of pain, Jesus acts with compassion on the man. He takes the stuff of the earth and mixes it with his saliva (in the ancient world saliva was thought to have medicinal value) to make a little mud. He wipes it on the man's eyes and tells him to go wash in the pool of Siloam. Siloam, as the writer points out, means "sent." The man goes where he is sent, washes his eyes in the water, and his eyes are healed. That's all there is to actual healing story. The rest of the chapter (34 verses) gives us a fly-on-the-wall view of the controversy that came from it. The neighbors saw the guy, and they're curious. "Is that the same blind guy who sat out here everyday to beg for money?" Some said yes; others said no. The man tells them, "Yes it's me! I've been healed!" They want details. He tells them what happened and who did it: "The man they call Jesus did it" (v. 11). According to verses 13 and 14, the neighbors decided to take the healed man to see the Pharisees (the religious leaders of the day) because it was on the Sabbath day that Jesus had made the mud and healed him. Basically, according to custom, it was sinful for Jesus to "work" to make the mud he used to heal the guy because it was the same action as "kneading dough," which was considered "work" and therefore (in their minds) was a breach of the instruction in Deuteronomy 5:12-14a: "Observe the Sabbath day by keeping it holy, as the LORD your God has commanded you. You have six days each week for your ordinary work, but the seventh day is a Sabbath day of rest dedicated to the LORD your God. On that day no one in your household may do any work" (NLT). The Pharisees ask him about what happened and he tells them the same story. Just like the neighbors, they are divided in their opinion. Some said Jesus was a sinner for "working" on the Sabbath. Others asked, "But how could an ordinary sinner do such miraculous signs?" (v. 16). They were divided about it. As I was reading this story and seeing these reactions - both from the neighbors and from the Pharisees - I was thinking, "What are you people arguing about? This blind guy can see now! Instead of celebrating with him and praising the one who did it, you want to form a committee to investigate whether the guy got healed like you think it should've been done! He's healed; isn't that the point?!" Of course, if you read through any 4 of the Gospels (Matthew, Mark, Luke, and John) you'll see that this is the Pharisees main problem. They're so obsessed with keeping the rules, keeping the traditions, and making everyone do things the way they've always been done, that they miss out on the new things that God is doing right in front of them. Not only do they miss out on the wonder of this man's healing, they completely miss out on Jesus. But the man just can't keep quiet about Jesus. He says, "I think [Jesus] must be a prophet" (v. 17). With that, the Pharisees sent him away. The Pharisees won't believe the man, so they ask his parents to verify the guy's story. They confirm that he's their son, but that's as far as they'll go. They're afraid they'll get expelled from the synagogue. That's not like being asked to leave a church today. There are churches everywhere now. If you don't like someone, or you don't like the pastor, or you just get bored, most people today will just go to another church somewhere else. But they had one place, one synagogue, and it was the center of community life. School happened at the synagogue. Worship was at the synagogue. Town meetings were at the synagogue. If you were kicked out of the synagogue, you might as well leave town. So the parents were full of fear, and they wouldn't take a stand. That leads to another conversation between the Pharisees and the man. It's in this conversation that the man utters the words that were made famous in the hymn, "Amazing Grace." 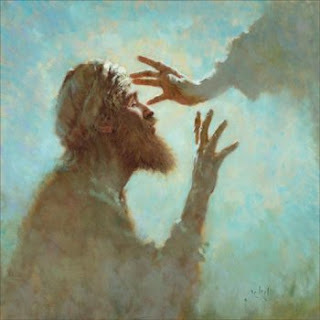 After the constant questioning and having to tell the same story over again, he boils the whole thing down: "I was blind, but now I see" (v. 25). Even though the Pharisees want to cite allegiance to Moses as the reason for rejecting Jesus, the astute reader of John's Gospel remembers what Jesus has already told the religious leaders, "It isn't I who will accuse you before the Father. Moses will accuse you! Yes, Moses, in whom you put your hopes. If you really believed Moses, you would believe me, because he wrote about me" (John 5:45-46). The blind guy is seeing more and more clearly, while the guys who could see are becoming more and more blind. Jesus heard about what happened, so he goes out (of town?) to find the guy. He asks him if he believes in the "Son of Man" (a title Jesus uses for himself based on Daniel 7:13). Judging by how things went from bad to worse for the guy, it wouldn't be surprising if he said, "Um, no. Look at what's happened to me. Look at what he did to me. Just yesterday I was hanging out by the pool. No one really bothered me, and I got enough money to get by. Now I've been run out of town! This is horrible." But he doesn't say that. He says, "Yes I want to [believe in the Son of Man]. Who is he?" (v. 36). When Jesus reveals that he is the Son of Man, the man's confession of Jesus' true identity and his confession of faith come rushing together: "'Yes, Lord, I believe!' the man said. And he worshiped Jesus" (v. 38). He can see clearly now, and he knows who Jesus really is. Some Pharisees see all of this happening, and they hear Jesus tell the man that he came "to give sight to the blind and to show those who think they see that they are blind" (v. 39). That, of course, doesn't sit well with them and they question Jesus about it. Jesus responds that their eyes are totally darkened. 1) The guy went from just appreciating Jesus for what he did to worshiping Jesus for who he is. Are you a worshiper of Jesus? 2) The guy didn't back down when people questioned him about Jesus. His parents backed down, but he stood up. Do you stand up, or do you back down when you are questioned about your faith in Jesus? 3) The guy simply shared what happened when he met Jesus. Do you share your story of what Jesus has done in your life?